This reading and listening exercise is based on events that occurred on 23 February 1981, when Lieutenant-Colonel Tejero led 200 civil guards in a coup d'état against the recently-formed Spanish democracy. It is suitable for level B1 Spanish students, though it contains some B2 grammar points. From 1939, the end of the Spanish Civil War, Spain lived under Franco's military dictatorship until his death in November 1975. Before he died he designated Prince Juan Carlos as his successor and, to the surprise of many, after becoming king, Juan Carlos I dismantled Franco's regime and began the transition to democracy, a period known in Spain as La Transición. Some say that La Transición ended with the first general election in 1977, others when the constitution was approved in 1978, yet others argue that it definitively ended 23 February 1981, the date of the failed coup d'état led by Lieutenant-Colonel Tejero. 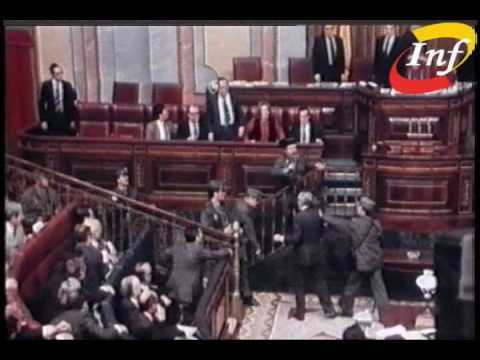 23 February 1981 was a dramatic and tense moment in modern Spanish history and is popularly known in Spain as 23-F. On the same day as the coup, a vote was in progress to confirm Calvo Sotelo as Prime Minister. The vote was being recorded for television, and this is the footage we see in the beginning of the video below. Shortly after the assault on Parliament another military leader, Jaime Milans del Bosch, led men and tanks into the streets of Valencia. King Juan Carlos I is widely considered to have been responsible for the failure of these actions. Wearing his military uniform of Captain-General of the Armed Forces, he went on television early in the morning of 24 February and declared his support for the democratically-elected government. With this, the insurgents, who had counted on the support of the king, knew that their action had failed. Some of the consequences of this failed coup were to give the young constitutional monarchy renewed legitimacy and in particular increased support for the King. This included not just public support, but support from political parties across the spectrum including the Communist party.